You might already know Susan from her blog Everything Susan. If you do, hurrah! If you do not, I encourage you to visit. Susan has a warm spirit and pleasant nature that resonates with her readers. And she is now a published author too!! 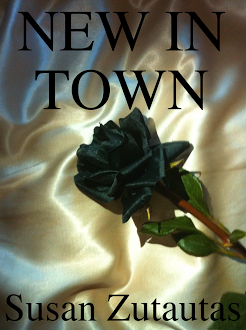 New in Town was published in the summer of 2013, so it is fairly new to the market, and looking to obtain its audience. It is a very well-written short story (62 pages) about a young woman who moves to Toronto to start her life anew. Knowing only a cousin who lives in the same apartment building, Morag sets about to live her new life to the fullest, and is well on her way to doing so, when a series of unthinkables begin to happen. Without killing the mystery for you (pun intended), I will note that there is a man involved, a good looking one at that; a break-in; and a resulting case that must be solved. You can learn more about the book by visiting Amazon. It is available on Kindle for $1.99. I hope you'll give Susan a hello, or a hearty congrats on her fairly new publish by visiting her blog: http://everythingsusanandmore.blogspot.com. You can also follow her on Facebook, G+, and/or Twitter. Sounds like a good read. Yes indeed. It's a good one. :) Fabulous day to you too, Sandee. I haven't yet met Susan Zutautas, but am happy to meet her. New In Town sounds like a great read. New In Town sounds like a great short story. I'm going to check it out! I just went in and bought it-love new authors and this sounds like a book I would enjoy and maybe review once I get to read it! I have never heard of this book but i think it would be a good read thank you for sharing. I'm all for short and sweet stories! I only have so much time to concentrate :) That is why it's hard for me to do book reviews :) And yet I love books so much. Great review! It sounds like a good read and one you don't want to put down. Congrats to Susan on being published - that's so awesome! Thank you for introducing me to Susan and her newest book! I love new books, and will have to add it to my Amazon Wish List for safe keeping. Well that sounds like an interesting book. Not quite my genre of choice, but I bet my aunt would love it! I hope you share the link with your aunt. :) Thanks for stopping by! I love a great mystery book. This New In Town book sounds very fascinating and that it could be a really fun read. Congratulations to her! It's a big undertaking to get a book published, so I'm really happy for her! Sounds like a good read! And yay for her for getting published! I always love when a good looking man is involved! Wink, wink! Oooh a good looking man ;-) Thanks for introducing Susan and the book. I like to support bloggers/authors so I will be getting it. I got a lot of free Kindle Books today, and this Kindle Book is not a lot of money. I will have to write the title down and get it when I buy some books. I like the story and would love to read it! Ohh, Karen! I love when I find free Kindle books that interest me. Once in awhile I find an author I really love that way!! Yet another blogger who puts temptation in my weak-willed way. Thank you, I think and a big CONGRATULATIONS to Susan. I love that it's available for the Kindle. Not everything is (and it should be). This sounds like a good read! Ok so I got the bait :) liked your description of the book. On to her site. This book sounds like a great read and, I agree with you, the power of friendship is a great thing. Rosey Thank you so much for writing this wonderful review! You've totally made my day! So glad that you enjoyed the book and will let you know as soon as the sequel is out. Don't you just LOVE the prices on ebooks? I feel like I can read every new book that comes out! I love them, but I wonder if authors do??? I don't think I know Susan, I'll have to go check out her blog! Before that though I'm going to go check out this book for my Kindle! It's a great book and I loved your review! Hurrah, I'm glad you read it!! Thank you for your visit! I love short stories because I actually have time to read them. I will have to check this one out. Me too!! I love longer stories too, but it's so hard to fit them in that I rarely, rarely, rarely find the time!! I'm a big fan of short stories since I never seem to have time to read due to my two boys :) Sounds like something I should look into! A visit from another author, hurrah! Your long book was the one exception I have made in a long time, for time (to read something lengthy) and it was so worth it!! I'm a sucker for The Count of Monte Cristo anyway... so to me that was a big treat. Thanks for reading about Susan's book! Looks like a great story! Thanks for hosting. I always love to read about new books. I love to learn about new authors and books too. Thanks for the visit! It's like author day over here today... another great author in the house, and you've got more books than anyone else I know! Thanks for commenting on Susan's book, it was a really good one!! Sounds like a great read! Thanks for reviewing it for us! It really was a joy to read. Thank you for your visit! This definitely looks like a great book to read. Wow! Sounds like a great book. Definitely going to have to grab the Kindle version! I love books that leave you wanting more after you have finished the last page. Congrats on the new book! I am going to add this to my must read list! Awesome. :) Thanks for the visit, Theresa. Looks like an interesting read! Going to add this to my list as you can't beat the price! I bet this would be a good one! I love print, but sometimes, the ebook is more affordable. how exciting!! a fellow blogger gets published- that's no easy feat!! Your review of this story has me wanting to check it out. To Amazon, I go! Sounds like a a great story I will certainly have to check it out! Or fortunately!! Since you rocked your mid-terms. High five to you for that! Congrats. This sounds like a good story. It's hard to find a good short story that flows, so will need to check it out. This one does flow nicely. I'm glad I got to read it. I love the Kindle when I'm a passenger in a car! I love short stories so I might need to check this out! Short is doable, seems like we're all so busy! Thanks for stopping over, Katherine! This was a good book. That's a great price! And it's short enough that I can read it while my son's napping. Thanks for sharing! Right! The length of it was perfect! I'd much rather have a book leave me wanting to know more than having it too long to finish easily. I don't read short stories often. This sounds interesting. I love short stories because I feel like I don't have as much time as I used to have to enjoy reading a big novel. Once I start a big novel I can't put it down. Short stories help me getting my reading in...without staying up til 4 in the morning! I really like the fact that this mystery story is only 62 pages. I can commit to 62 pages! The story sounds like a great read. It's nice to get lost in a book for a bit. This story was the perfect size for a car drive (I was the passenger ;) ). I'm definitely intrigued and at only $1.99 it's so worth the buy! I love novellas. My kind of reading because I can finish it and not forget what the beginning was about, LOL. I will have to check this one out. I like reading stories with a really strong friendship element. I'm trying to learn how to be a better friend. Short stories are about all I have time for nowadays! Thanks for the review. I should definitely start reading short stories. I have so much going on. I am currently reading a book and it's been over 4 weeks. Usually it never take me this long. My reading list is longer than I have the time to invest too. This is my first time hearing of Susan Zutautas. I will have to check out New in Town, though, because it sounds like a great mystery! The characters were very easy to picture while reading, and even after the book was done. Another great read for the coming weekend. TY Rosie for this one. Thanks for sharing! I have a stack of books on my "to read" list that's waiting for me! This sounds like a good read to add to my collection. I love a good book and this really does seem like something I would enjoy. Thank you for the recommendation. I'm always looking for new books - I love ending my day reading a few chapters. Sounds like a good one. I love a well-written short story. She did a great job with this one, I really enjoyed it. Sooo excited that you got published... sounds like a good one.. can't wait to read it all.. Loved the review..
Wow - Seems like a totally good read! Cheap too! $1.99 on Amazon is a great deal! Congrats to Susan on her book! I know. And I'm excited for her too. :) Thank you for your visit! Ebook prices are so awesome!! Def one I need to read soon! Thanks for the wonderful review! This book sounds interesting. I want to check it out since it is from a fellow blogger. Sometimes moving is good, other times... maybe not. ;) Thanks for you visit! This sounds like a great read. I love your review and the cover too. Finished it last night! Thanks for the recommendation. I'll reach out to Susan and let her know.